A chapter of the layered geological history of Mars is laid bare in this postcard from NASA’s Curiosity rover. 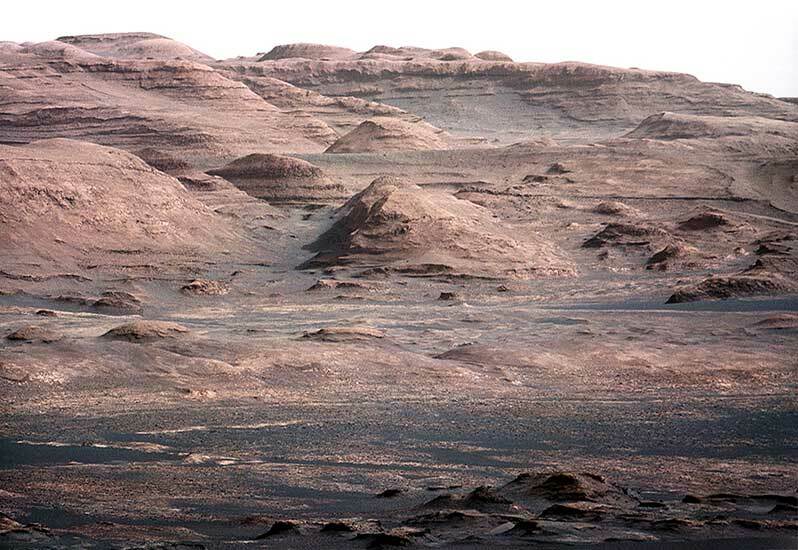 The image shows the base of Mount Sharp, the rover’s eventual science destination. This image is a portion of a larger image taken by Curiosity’s 100-millimeter Mast Camera on Aug. 23, 2012. Scientists enhanced the color in one version to show the Martian scene under the lighting conditions we have on Earth, which helps in analyzing the terrain. See the picture in larger dimension on my HD Photo Blog. Time lapse sequences of photographs taken by the crew of expeditions 28 & 29 onboard the International Space Station from August to October, 2011, who to my knowledge shot these pictures at an altitude of around 350 km. Music: Jan Jelinek, Image Courtesy of the Image Science & Analysis Laboratory, NASA Johnson Space Center, The Gateway to Astronaut Photography of Earth. Editing: Michael König. A Collection of space images taken by telescopes such as the Hubble, Spitzer and the VLT (Very Large Telescope). Image Credits: NASA, ESA & ESO. Edited by R. Smittenaar. Music: by John Serrie – Tingri Maiden. 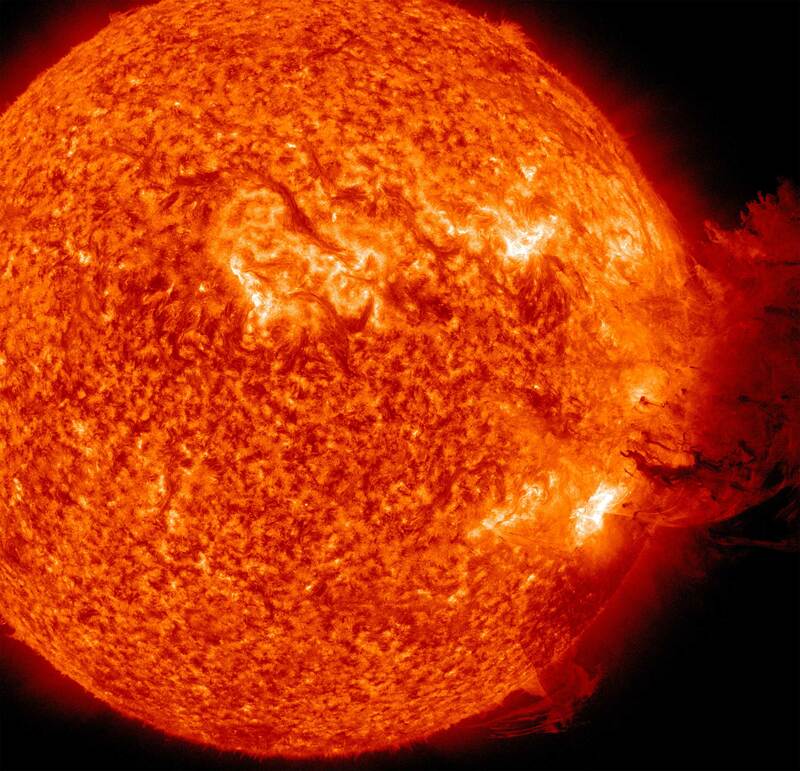 In an event reminiscent of some of the Discovery Channel Mythbusters’ most spectacular explosions, the Sun on June 7, 2011, starting at about 06:41 UT unleashed one of the most spectacular prominence eruptions ever observed, in fact, one could call it a “prominence explosion”. But this explosion was larger by far than any rigged by Mythbusters: the prominence material expanded to a volume some 75 times as big across as the earth. SDO’s Atmospheric Imaging Assembly recorded the amazing event in stunning detail, and SOHO’s LASCO coronagraph and STEREO’s SECCHI instrument suite observed the prominence and associated CME as they traveled out into the heliosphere. Using LASCO and SECCHI data, the speed of the leading edge of the CME was estimated to be in the range 1200 – 1600 km/s. Model calculations predict that Earth will receive a glancing blow of the CME on June 10, possibly sparking some nice aurorae at high latitudes. The event originated from the almost spotless active region 11226 and was associated with a moderate M2-class X-ray flare. The CME and associated shock wave produced and S1-class radiation storm, which shows up as speckles in the LASCO movies. This event is not only one of the most spectacular ever recorded, but also one of the best observed, with complementary data from several spacecraft and different vantage points (SDO, SOHO, STEREO). (Source: http://sohowww.nascom.nasa.gov/hotshots/index.html) CLICK ON THE PICTURE TO SEE IT IN LARGER SIZE and watch the picture on the PhotosHD Blog. A new study suggests the Milky Way doesn’t need a makeover: It’s already just about perfect. Astronomers base that assertion on their discovery of a vast section of a spiral, star-forming arm at the Milky Way’s outskirts. The finding suggests that the galaxy is a rare beauty with an uncommon symmetry — one half of the Milky Way is essentially the mirror image of the other half. Thomas Dame and Patrick Thaddeus of the Harvard-Smithsonian Center for Astrophysics in Cambridge, Mass., say the structure they’ve discovered is most likely the outer extension of the Scutum-Centaurus arm from the inner galaxy. 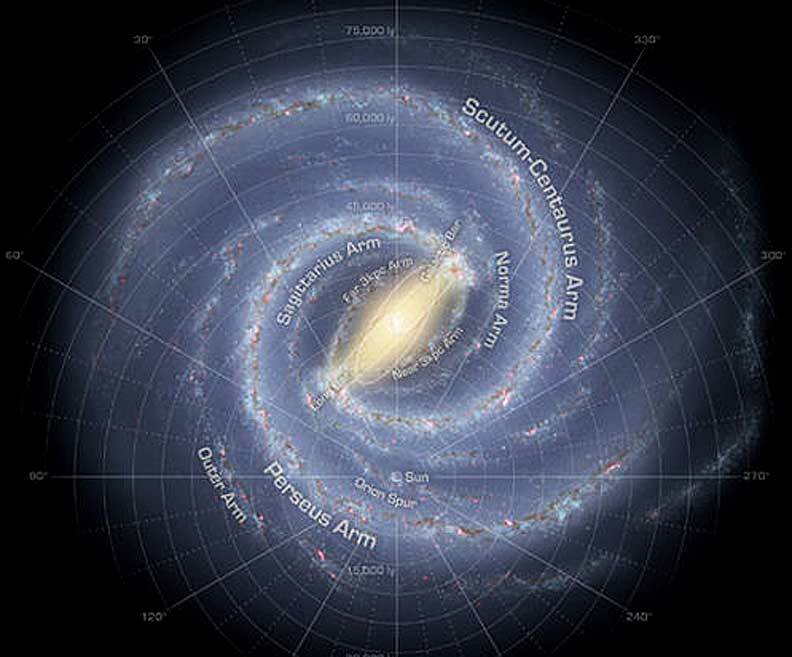 The finding suggests that Scutum-Centaurus wraps all the way around the Milky Way, making it a symmetric counterpart to the galaxy’s other major star-forming arm, Perseus. The two arms appear to extend from opposite ends of the galaxy’s central, bar-shaped cluster of stars, each winding around the galaxy, the researchers note in an upcoming issue of Astrophysical Journal Letters. Dame found evidence for the new structure while reviewing galactic data on atomic hydrogen gas, which radiates at a radio wavelength of 21 centimeters. After tracing the extension of the arm in the 21-centimeter radio emission, “I was in the unique position of being able to walk up two flights of stairs to the roof of my building [at Harvard] and search for carbon monoxide emissions from molecular clouds using the CfA 1.2-meter radio telescope,” says Dame. Molecular gas clouds contain the raw material for making stars. The Crab Nebula has stunned astronomers by emitting an unprecedented blast of gamma rays, the highest-energy light in the Universe, from a small area of the famous nebula. The cause of the 12 April gamma-ray flare, which lasted for some six days, hitting levels 30 times higher than normal and varying at times from hour to hour, described at the Third Fermi Symposium in Rome, is a complete and total mystery. The Crab’s recent outburst is more than five times more intense than any yet observed. Nasa’s Fermi space observatory is designed to measure only gamma rays, that emanate from the Universe’s most extreme environments and violent processes. Since its launch nearly three years ago, Fermi has spotted three such outbursts, with the first two reported earlier this year at the American Astronomical Society meeting. The Crab Nebula is composed mainly of the remnant of a supernova, which was seen on Earth to explode in the year 1054. At the core of the brilliantly coloured gas cloud is a pulsar – a rapidly spinning neutron star that emits radio waves which sweep past the Earth 30 times per second. But so far none of the nebula’s known components can explain the signal Fermi sees, said Roger Blandford, director of the Kavli Institute for Particle Astrophysics and Cosmology, US. “The origin of these high-energy gamma rays has to be some other source,” Blandford told BBC News.”It takes about six years for light to cross the nebula, so it must be a very compact region in comparison to the size of the nebula that’s producing these outbursts on the time scales of hours.” What has stumped astronomers is that these variations in gamma rays are not matched by changes in the emission of other light “colors”. Follow-up studies using the Chandra X-ray telescope, for example, showed no variations in the X-ray intensity. Sun flares: powerful or scary? April 21, 2011 marks the one-year anniversary of the Solar Dynamics Observatory (SDO) First Light press conference, where NASA revealed the first images taken by the spacecraft. In the last year, the sun has gone from its quietest period in years to the activity marking the beginning of solar cycle 24. SDO has captured every moment with a level of detail never-before possible. The mission has returned unprecedented images of solar flares, eruptions of prominences, and the early stages of coronal mass ejections (CMEs). In this video are some of the most beautiful, interesting, and mesmerizing events seen by SDO during its first year up to March 10th 2011. On the one side this videos shows us the beauty of the universe and our dearest power source, the sun, and on the other side it shows us potential dangers that might interact with our fragile modern world of technology. In any case it is good to know about it.